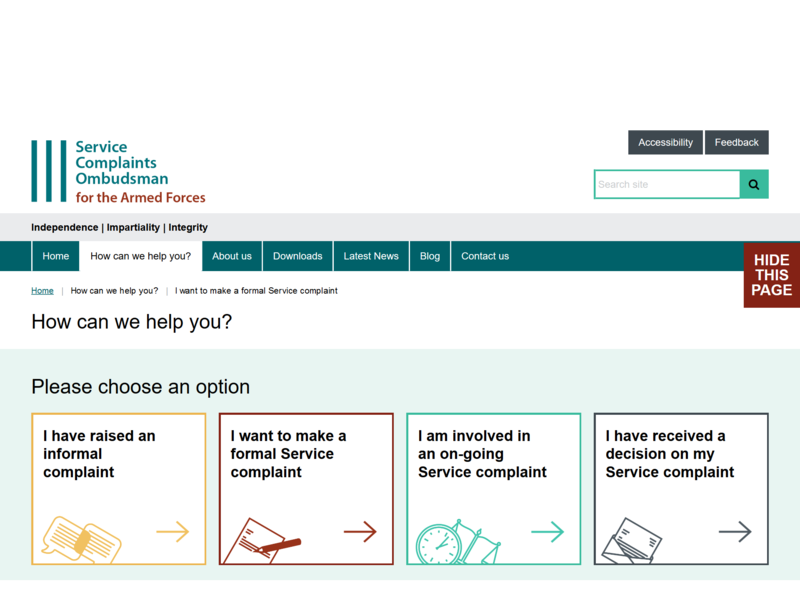 In early 2018, the Service Complaints Ombudsman for the Armed Forces (OSCO) appointed Connect to redesign their website and build an extranet to house internal documents. The Ombudsman provides independent and impartial oversight of the service complaints system for members of the Armed Forces. 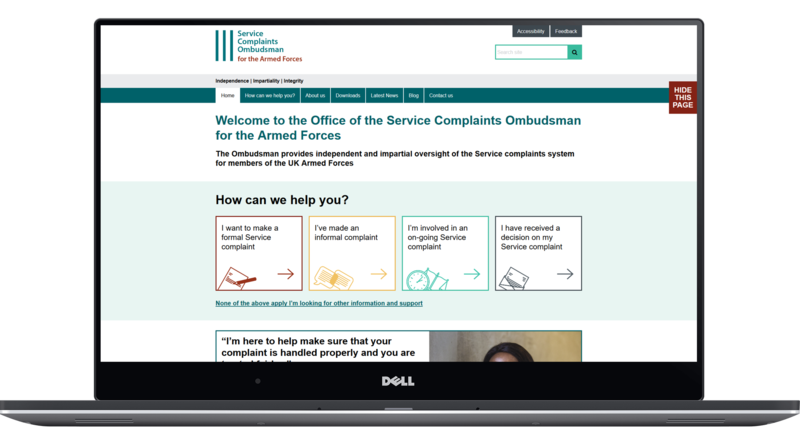 Through their website, the Ombudsman provides a vital service to serving and former members of the Armed Forces wishing to make a complaint. 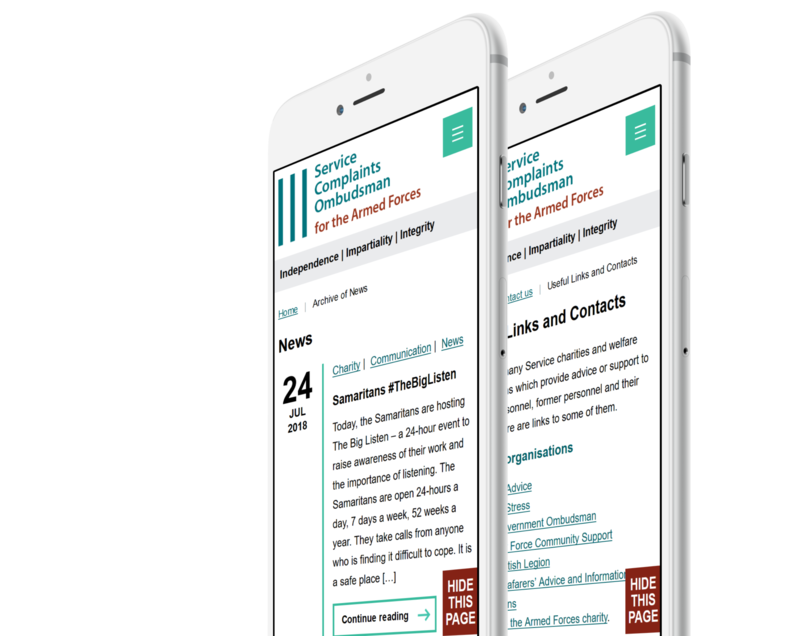 Submitting a complaint can be a daunting prospect, and the aim of the new site is to illuminate a path to information in a way that eliminates barriers and allows ease of access for all. The Ombudsman’s previous website was built using a shared infrastructure that did not meet requirements. User feedback for the site highlighted issues with content discovery and confusing navigation, in particular. A key consideration for the OSCO was to improve interactivity with the new website. This has been achieved in a number of ways, but most prominently through the development of a decision tree. This easy to understand support tool uses a model of decisions and their possible consequences, guiding users through the often complicated complaints process in a clear, sympathetic manner. Users are able to navigate through each process by responding to a series of questions, with advice provided throughout. If users cannot find the information they are looking for, a link invites them to browse further helpful content. A complementary extranet serves as a members-only area that provides restricted access to documents. Content published to this part of the site is visible only to users via secure login. The flexible nature of our solution means that the OSCO has the capability to add a limitless number of areas to the extranet. Mobile optimisation played a significant role in the development of the website, in particular, as the OSCO found that some users prefer to use mobile devices or tablets to access the site at work, but are concerned about security and confidentiality. The site has been designed using our fully responsive theme, meaning that it automatically adapts to different screen sizes. All areas of the website and extranet have been built for, and are accessible from, desktop, tablet and mobile devices. Both the website and extranet are powered by WordPress, which provides many advantages for the OSCO, including powerful-yet-simple asset management and publishing controls. 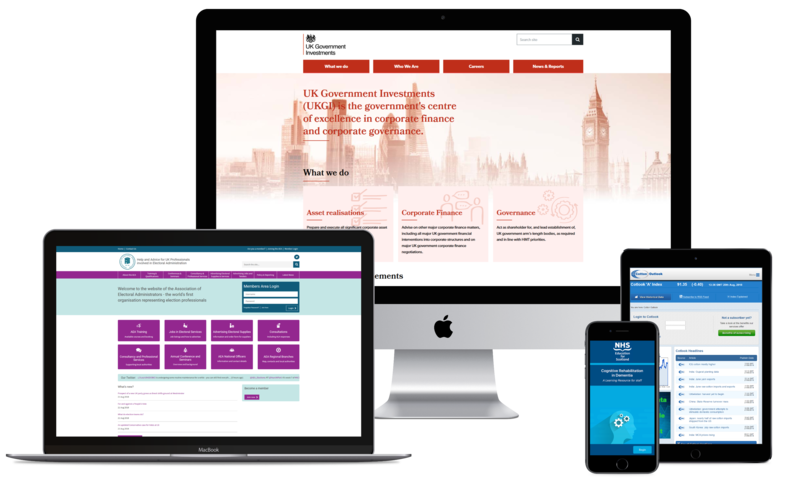 Overall, the redesigned website and extranet have helped the OSCO to kickstart their digital journey, respond more quickly to user need by providing access to intuitive support solutions, increase the quality of guidance and improve interactivity through form digitisation. As a reflection of our work, a second development phase has already been commissioned. Phase II will see the addition of an online application portal, allowing users to submit applications via the website and upload required documents. This will further improve the level of interactivity users have with the site, and reduce the complexity of asset management for staff members at the OSCO. “The transition between the planning stages and the implementation of our new website was efficient and effective. Connect provided great advice and suggestions for improvement and were supportive in answering any questions that we had.